Description: The flowers are tubular, cylindrical to urn-shaped, triangular-lobed, and up to almost 1/2 inch (12 mm) long. 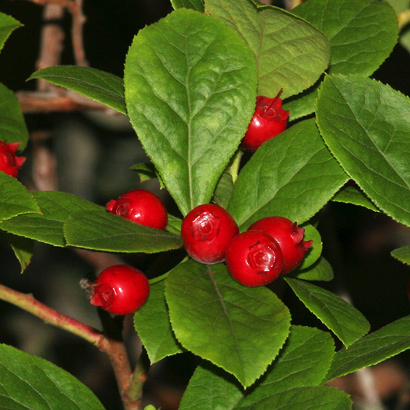 The flowers are followed by round, bright red, up to 2/3 inch (15 mm) in diameter berries with numerous small seeds. The leaves are green, hairless, alternate, saw-toothed, 2 to 3 inches (5 to 8 cm) long, and egg-shaped to obovate (narrower near the base and wider near the tip). The shrubs are clumping and have multiple, erect branches. Ohelo Kau La'au grows in wet native rainforests and in bogs. 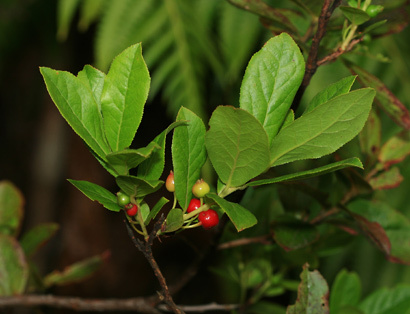 Two other, very similar Vaccinium species are found here in Hawaii, but Ohelo 'Ai (Vaccinium reticulatum) is a smaller plant and has more flavorful berries and smaller leaves, while Ohelo (Vaccinium dentatum) is also a smaller plant and has more sharply toothed, elliptic leaves. Edible – The fruits are sweet and edible, but they are rather insipid not nearly as flavorful as those of Ohelo 'Ai.